If Rangers go on to win the league this season, they will look back on this victory as one of the most crucial. They played poorly for the first hour and fell behind early on to an Alex Burns strike. 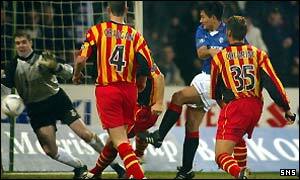 As the game progressed, Thistle began to defend deeper and Michael Mols finally grabbed the equaliser. Gerry Britton was harshly sent off with 18 minutes remaining and Ronald de Boer scored the winner seven minutes later to give Rangers a rather fortuitous three points. Rangers started in confident mood, with De Boer and Peter Lovenkrands passing up early chances. But it was Thistle who took a shock lead in only eight minutes. The ball was flicked onto Kenny Milne by Britton and when the midfielder flashed the ball across goal, Burns was on hand to smash it past Stefan Klos and Barry Ferguson. Martin Hardie was next to test Klos with a powerful header that the keeper gathered. It was 26 minutes before Rangers mustered another effort on goal as a result of Thistle's determined approach, Lorenzo Amoruso shooting wide from distance. Craig Moore was fortunate not be sent off after half-an-hour for a late challenge on Stephen Craigan having already been booked. Amoruso saw another long-range effort saved by Kenny Arthur before Burns twice narrowly missed the target from 25 yards. Rangers changed their shape at the beginning of the second half, but Thistle continued to match them. Stephen Hughes tested Arthur from outside the box after 55 minutes and the keeper did well to get up to block Mols' effort from the rebound. Mols ought to have equalised on the hour mark but he blazed the ball over the bar from only eight yards out, with the Thistle defence carved open for the first time. But Mols finally got the equaliser with 20 minutes remaining after Arthur parried Lovenkrands' shot into his path. Moments later Thistle were reduced to 10 men when Britton was red-carded after reacting to a Kevin Muscat challenge. Britton gestured with his hands but unintentionally caught Muscat in the face and the Australian fell to the ground and referee John Underhill did not hesitate in showing the striker the red card. That incident rattled Thistle and in 79 minutes Rangers took the lead after poor defending by the Jags from a corner and when the ball dropped to De Boer he drove it through the legs of Lovenkrands into the net. De Boer had another effort well held by Arthur but Klos earned his corn with a fabulous one-handed save from Hardie in the closing minutes. Mols missed a golden opportunity to seal the win in injury time but Rangers held on. Partick: Arthur, Lilley, Archibald, Chiarini, Craigan, Paterson, Mitchell (Lennon 82), Milne (McLean 80), Hardie, Britton, Burns. Subs Not Used: Budinauckas, Gibson, Waddell. Rangers: Klos, Hutton (Malcolm 46), Muscat, Amoruso, Moore, Latapy (Caniggia 38), Ferguson, Hughes (McLean 66), Mols, De Boer, Lovenkrands. Subs Not Used: McGregor, Nerlinger. "Rangers took 55 minutes to get a shot on goal"
Who will win the SPL?